So I’m going with the name PhotoFile for my new project. Clever, I know. Actually, not sure what exists out there already, like this or with a similar name. A quick google search didn’t reveal much. Either way, I’m sure nothing exists that is quite so perfect for ME (I’m incredibly selfish), and I think this will be a good learning experience, so I plan on getting it to a reasonably usable state, at least. I liked the original left-to-rightness, as it visually led the user through the workflow; and that’s how I originally envisioned it. But the whole thing was getting too wide. So I’ve updated the GUI a bit (not final by any means) and I think this is looking better, for now. Open to ideas/suggestions, of course. Since last upate, I’ve done some (much needed) code refactoring and cleaning up, added minimal Exif support using EXIF.py, and some GUI modifications (file list frame is resizable, added the filename below the thumbnails, moved the Original thumb above the Preview thumb). Most of it is still just GUI stuff and it’s not functional, but it’s getting to a point where I will easily be able to make a few things functional. Posted on Wednesday, September 12th, 2007 at 4:30 pm. 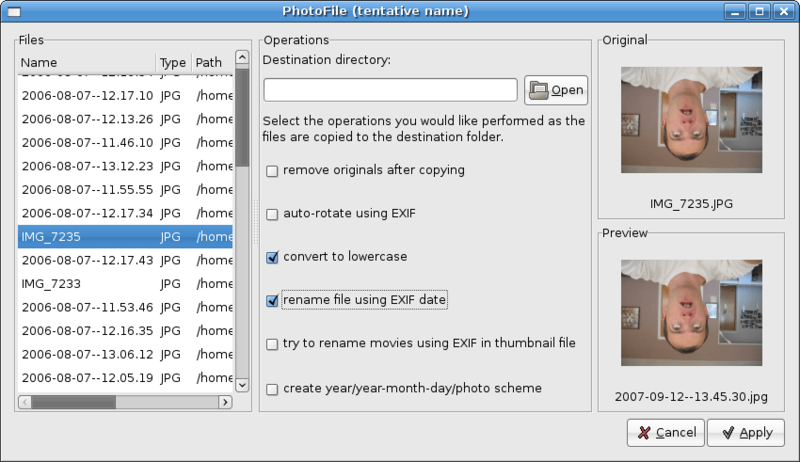 Tagged with: Development, Gnome, Linux, PhotoFile, Photos, screenshots, UI. i like you didnt even bother to google photofile and discover there’s an entire company with that name already. may i suggest picfile as it’s 1) not taken, and 2) your software CAN be applied to more than just photos. A quick google search didn’t reveal much. P-phile is the way to go. That photo looks better than your current userpic.